A number of measures of mindfulness have been developed to assess one or more facets of mindfulness. However, to date, all of these have been validated by comparing the mindfulness questionnaire with other self-report measures of theoretically related constructs. Given the problems of demand characteristics and shared method variance, other approaches to validation are warranted. Therefore, we sought to determine whether individuals who describe themselves as more mindful evidence lower levels of stress reactivity. Thirty-six university students completed the Kentucky Inventory of Mindfulness Skills and the Paced Auditory Serial Addition Test. Results indicated that those individuals who described themselves as more mindful show smaller cardiovascular increases in response to the stress task (heart rate r = −0.38, diastolic blood pressure r = −0.43). 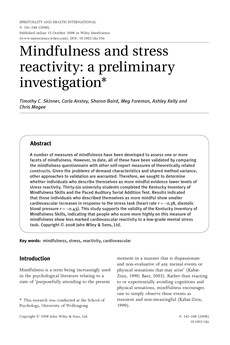 This study supports the validity of the Kentucky Inventory of Mindfulness Skills, indicating that people who score more highly on this measure of mindfulness show less marked cardiovascular reactivity to a low-grade mental stress task.